Spread the Christmas spirit with this magical Christmas gift and Plan Gift Card. 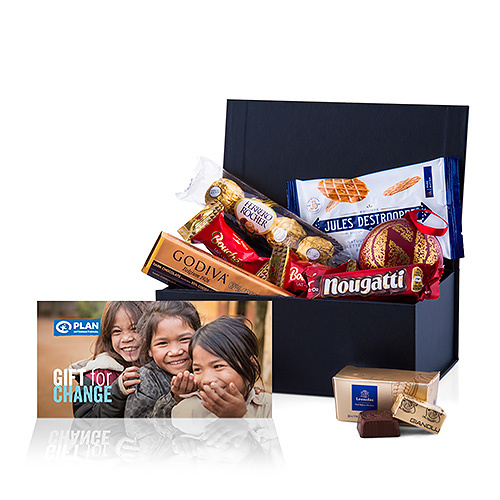 Your friends and family will be delighted with the delicious assortment of Christmas treats, and even more so when they notice their gift also provides a young child with a nutritious breakfast for a year. Thanks to this Christmas Gift, Plan International Belgium is able to provide a child with a nutritious breakfast for a whole year. Children at all Plan Kindergartens are served a nutritious breakfast. That ensures they have the energy and concentration to enjoy a day of learning in class. Breakfast for children is an investment in the future!